MONTREAL—Systems integrator Moog Audio recently installed a complete audio system by HARMAN Professional Solutions at Hotel William Gray, a new boutique luxury hotel located in the heart of downtown Montreal. The building consists of a newly constructed glass tower integrated with two historic buildings that date back to the 18th century. Owner Group Antonopoulos hired Moog Audio to install a new audio system that would match the hotel’s chic style and provide a great listening experience for guests. Moog Audio selected a complete HARMAN solution consisting of JBL Control Series speakers, Crown amplifiers and BSS Audio networked audio systems. The integrated system provides Hotel William Gray with exceptional sound quality, easy-to-use operation and clean, modern styling. SC Media Canada supplied the audio equipment for the entire project. Using a single distributor and a complete HARMAN solution helped Moog Audio streamline the installation process and complete the project quickly and efficiently. 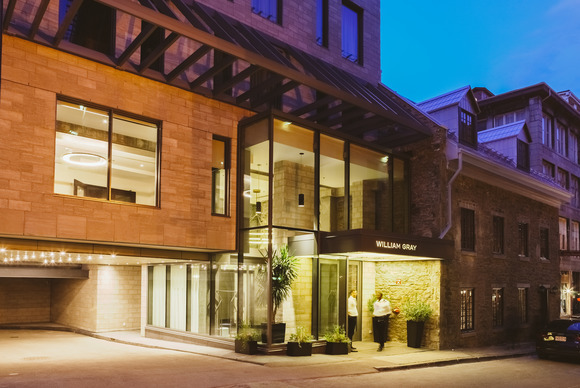 The eight-story Hotel William Gray features 127 guest rooms and 10,000 square feet of event spaces, including an upscale restaurant and lounge, roof terrace, luxury spa with outdoor pool, ballroom, indoor garden, fitness center, boutique clothing store and Café Olimpico—a famous Montreal establishment. Moog Audio wanted to create one centralized and interconnected audio system for the entire hotel, which would allow the staff to play the same music throughout all of the different locations in the building simultaneously, and create a consistent, cohesive atmosphere for guests. Developing one system for the entire building proved to be a challenge, since each area had unique requirements. The restaurant needed larger speakers in order to accommodate musical performances, while the ballroom needed versatile speakers that could be optimized for speaking conferences and presentations. And the outdoor terrace speakers needed to be weatherproof to protect against the elements. Thanks to the wide variety of speaker sizes in the JBL Control Series line, Moog was able to customize the solution perfectly to each different environment. Due to the customizable nature of the BSS Audio system, Moog Audio was able to create presets to minimize any feedback and easily tune the system room by room, ensuring that everything was operating at maximum efficiency and there were no frequency issues.